Written on September 29, 2009 by Kevin. Rylan has been asking that Grandma stay for a sleep over for a couple years now. It finally happened on Saturday. We headed out for dinner and then out to a local Arab festival. We went home and all got settled in by watching some movies and giving the kids some special treats. We were going to let the kids stay up as late as they had wanted so we were very curious just how late it would be. Kaitlyn finally passed out about 1:00am and Rylan followed at 2:30am. The rest of us talked for another hour or so with the thought that the kids would be sleeping later in the morning. Unfortunately that was not the case. Kaitlyn had a bad night of rolling around and nightmares. Rylan woke up at 8:30am and just wasn't interested in going back down. Needless to say, we were all very tired in the morning. The end result though was that the kids had a blast. They are already requesting to do it again. And here is a picture of Kaitlyn as she was slowly crashing. She was clearly getting a bit crazy. Written on September 25, 2009 by Rylan & Kaitlyn. Well definitely the highlight of the week was flying kits with Mom and Dad. Kaitlyn and I were running around and chasing after the kites. Kaitlyn had her kite flying up in the air and then she let the string slip out of her hands. Dad went running after it and we were right on his toes. It was really fun. This week we have been preparing for the Halloween party that we will be hosting. Yes we know it may be a bit early but this is our first year throwing a party and we are super excited. The house is getting very scary. Mom and Dad have been helping us make these very neat decorations. I think we are making ghosts this weekend. We already made pumpkins with Mom which was really fun. It definitely is going to be a great Halloween party. Well not much else happened this week but I know we have an exciting weekend coming up. We are going to have a sleepover this weekend and we are all going to stay up as late as we can and just watch movies and have fun. It definitely is going to be neat to see who can stay up the latest. I am not so sure about Kaitlyn. I think she will be the first to go. Let's go fly a kite, and send it soaring. Written on September 24, 2009 by Kevin. The other day we headed out to the park to fly kites and the wind was perfect. We have taken the kids out to fly kites in the past but never with this amount of consistent wind. Rylan's kite flew great and it was up in the air for a very long period of time. If you ask him, he will tell you that he almost hit a passing plane and it would have stuck to it because the plane had gum on it. Kaitlyn's kite is your old fashion diamond shape and it just didn't want to stay up too well but we had fun chasing after it together and throwing it back in the air. Rylan: Your skin is still hot. Mom: The sun is a big ball of fire and it's very hot. Rylan: *serious face* Well somebody had better put some water on it. Written on September 22, 2009 by Kevin. Rylan had full control over Kaitlyn's outfit today. This is what he came up with. They both loved it. Written on September 18, 2009 by Rylan & Kaitlyn. Last weekend we headed out to our local pound to see if there were any dogs that were nice. Our Grandpa met us there to so we all could look together. We saw a lot of neat dogs but nothing worked out for us. Dad made plans for last night that were for something we had never experienced. We have tried watching movies at the big theaters but its a very touchy event and sometimes it just doesn't work out. Dad however decided to try something different, a drive-in movie. In fact, we got to watch the double feature of Disney's UP and Night at the Museum 2. Dad cleaned out the back of the van and removed the bench so we would have a nice place to sit. The movies were good. Kaitlyn and I found it a bit difficult to sit in the van all evening but we made it work and had a good time. It definitely is a fun way to watch a movie. Oh our Dad has really outdone himself. Last night, for the movie, he made us a deep dish pizza! He began working on it as he got home and when it was done we took off to stake our spot in the parking lot. We waited a bit before tapping into the pizza and boy was it worth it. He had never made a deep dish pizza before but Kaitlyn and I both agree it will not be his last. This was one thick airy pizza with just the right amount of sauce and pepperonis. The best part was that Kaitlyn and I didn't make any mess with it. To top off the meal he made some extra yummy garlic bread sticks. I always tell him that I love his recipes and I know Kaitlyn does too. Well lets see. It was over a month ago that Kaitlyn had what appeared to be an allergic reaction to some Cocoa Pebbles cereal despite the ingredients looking OK. We spoke to the Food Allergy and Anaphylaxis Network and they helped get the University of Nebraska to test the cereal for us. They tested for all of the things that we know Kaitlyn is allergic too and yesterday they came back with the results. Negative for all allergens. The mystery continues on what exactly caused the reaction for Kaitlyn. At least Kaitlyn is safe and now we know that the cereal should be safe as well. That's about all we did this week. This weekend we have a few events planned but nothing too big. Have a fun weekend everyone. Psss. My birthday is a month away! Written on September 11, 2009 by Rylan & Kaitlyn. Do you know the muffin man? We do! It turns out that the muffin man is our dad. He has been making some very delicious muffins lately. Healthy muffins with a bit of fruit goodness to top it off. I don't know what Kaitlyn and I did but we sure picked some great parents that can cook and bake up a storm. Speaking of storms, we have finally had a few good monsoon storms roll through. We almost went the entire summer without any substantial storms but recently that had changes. We knew a storm was coming but we decided to go to the grocery store anyways. I told everyone that we needed our umbrella but they decided not to get it for some reason. While driving to the grocery store we drove right into the storm and boy was it a good one. We ran out of the car and into the store and everyone looked at us funny for being soaking wet. It was pretty darn funny. So it is now time to start planning for my birthday. I was really bummed when Kaitlyn had her party and I really felt like I was never going to have one. That has all changed now because Mom and I are planning now. We have finalized on doing my birthday party next month at a bowling alley. We had such a good time bowling that we thought it would be fun. I guess we didn't do much this short week. With our Dad being home for the extended weekend we all got to sleep in a bit and relax. That is just what we are going to do today on our lazy Friday with Mom. Have fun everyone. Written on September 8, 2009 by Kevin. 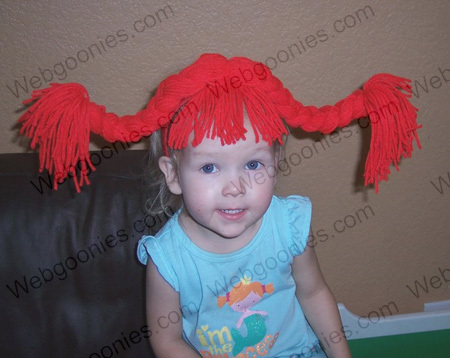 Kaitlyn's favorite movie character right now is the classic Pippi Longstocking. Her mom decided to make her up this dress up piece. She won't put it down now.